I went on and on about my lemon trees the other day, and when I have a good year for lemons like I just did, I love getting to make limoncello. Limoncello is a simple liqueur involving lemon peels, vodka, and simple syrup. Every recipe I’ve seen seems to suggest a different number of days for the lemon peels to sit in the vodka (three days to 10) and then a different quantity of simple syrup to add at the end (two-thirds cup to three cups for 750 ml vodka). Whichever recipe you use, once it’s ready it can be mixed into all kinds of cocktails, and my favorite is a simple combination of limoncello and club soda over ice. Limoncello can also be used in all kinds of desserts. As I was waiting for my lemon peels to steep in the vodka, I was busy trying to locate a recipe I had seen before for some kind of limoncello cheesecake. It was a year ago if not longer that I had seen this, and I have no idea where I first saw it. In my search, I came upon Giada’s recipe for limoncello cheesecake squares, and that may even have been what I was remembering in the first place but I don’t think so, and I ended giving them a try. In Giada’s recipe, biscotti are used to form the crust, but I used graham crackers in their place since I had some handy. The graham cracker crust was formed with melted butter and lemon zest, and it baked until golden and was allowed to cool. The filling was made from ricotta, cream cheese, lemon zest, sugar, limoncello, vanilla, and eggs which were combined in a food processor. The filling was poured over the cooled crust, and it baked in a water bath for about an hour. After cooling on a rack for an hour, it was refrigerated overnight. It was very simple to prepare, and since it baked in a nine inch square pan, there was no need to wrap foil on the bottom to prevent water from entering. The square pan was easier for baking, but I was unsure how easily the cut pieces would be to remove from it. Actually, it was one of the easiest desserts ever to cut and serve from the pan. The crust held together well, and there was no sticking at all. The limoncello flavor was delightful but was not at all overpowering. This was a rich and creamy cheesecake that wasn’t as dense as others. I’ll have to try it again someday with the biscotti crust, or maybe I’ll eventually figure out which recipe I was looking for in the first place. I love the idea, the flavour has to be wonderful and isn't Limoncello sipped after dinner as a digestive? This would be my digestive! Perfect little creamy squares! Lemon flavored cheesecake, that's to die for! Wow Lisa, this is really look delicious. I was just thinking about picking up my meyer lemon, wondering what should I make out of it. Could it be this? 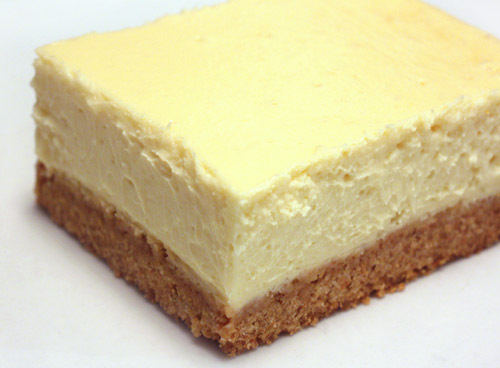 I am now officially cheesecake obsessed - I was at another site, drooling over one, and now your amazing squares! I am so jealous of your lemon trees. The only way to appease me is to send some of these ASAP . . .
Oh how I wish I had lemon trees. But I do have homemade limoncello so I must search out that luscious cheesecake recipe. looks so creamy. Yummy cheesecake. I think I shall be making me some limoncello now. I have a bunch of lemons a friend gave me that I need to use. This sounds like heaven. I have a few bottles of limoncello in the freezer and I think putting them to use making these cheesecake squares sounds about perfect. Lisa, you're wonderful. I used to work at Olive Garden, so I've had limoncello before...but never in a dessert! Yum yum yum yum. I adore limoncello, so this dessert looks amazing. Waw,...this limoncello cheesecake sounds like a real winner! OH, and to think I'm married to the anti-cheesecake by definition! PERfection. 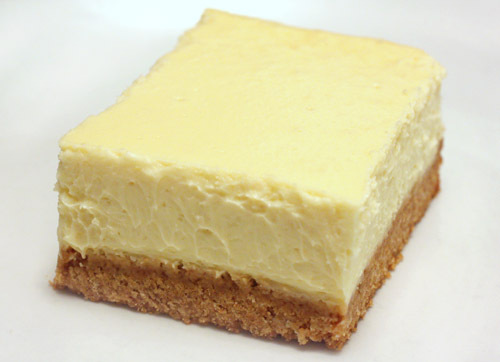 this is a superb creation, from the thick crust to the creamy, tart cheesecake. masterful work, lisa! Delicious! The texture on this looks perfect. That looks so good. I've been wanting to try and make limoncello, and this gives me even more incentive! That looks so luscious, creamy, rich and decadent! What perfect texture! And we love all things lemon but with limoncello? Wow! Fantastic! And I just happen to have a bottle! Divine! Decadent! Luscious! To Die For! Oh they look so good. Creamy and delicious looking. Wow! I always see limoncello in recipes and think, "I'm not going to buy it just for that!" But this post has made me think: 1) It has so much more appeal when I know I can make it myself and 2) This recipe makes the limoncello worth it! Mm this sounds great. Love those neat slices and I can never say no to treats with a little extra kick 8). It looks delicious Lisa. I really do wish I had a lemon tree in my garden that would provide me with a good supply of these yellow darlings! Your cheesecake looks gorgeous! This sounds and looks really great! Time for me to get a bottle of limoncello. This looks wonderful, Lisa. When I lived in Italy, because of a scheduling mix-up, I ended up living with a group of nuns in Sorrento who made their own limoncello. They put it in everything. They were boozy little ladies! 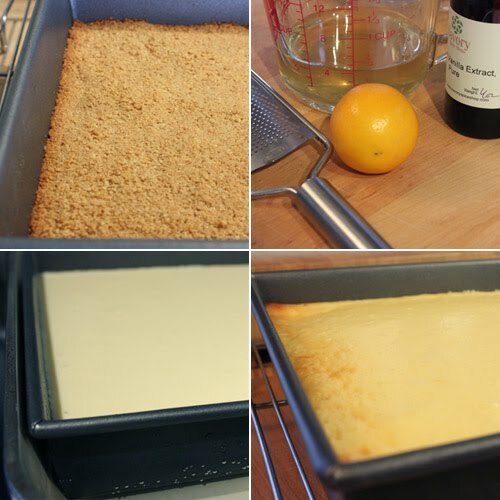 The cheesecake squares flavored with limoncello sound just heavenly! What a perfect treat! Those are beautiful, Lisa! How interesting to have lemon zest in the crust. Giada does love to use lemons in everything, but I agree. 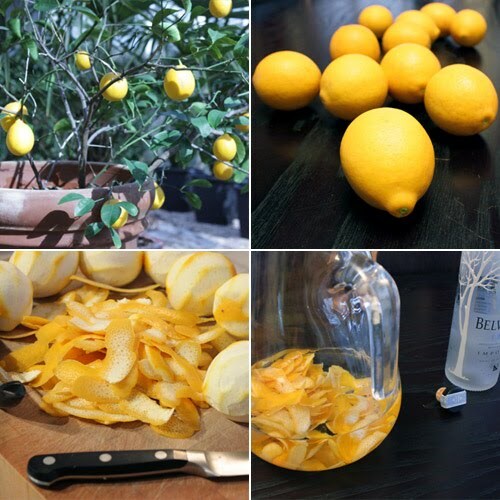 Nice to hear how simple it was to cut...I have a bottle of limoncello right on my counter. Usually I use it on fruit. Now I have another recipe to try! I've never made limoncello myself and you're inspiring me to try, becasue it really is a wonderful additon to desserts and summer juices and sorbets. this cheesecake looks really delicously light..hope you do find your recipe though? These look heavenly especially with your homemade Limoncello! I love that it's cooked in a regular pan. Your squares are so perfect! what a sophisticated cheesecake with the addition of lemoncello, looks almost like a custard. What a delicious, creamy, tangy, cheesy recipe! I just love the looks of it! Citrus lovers everywhere are rejoicing for this. Now I want to plant a lemon tree!! How gorgeous. Lemon tree!!! I saw a lot in Pescia in Tuscany last Summer. I was taught how to make limoncello, they use 95% alcohol, and only I think in Italy you can buy that. I got a bottle in the supermarket and shhhhhh.......... It's lovely to have your own grown citrus but my Kamquat did not survive : ( I was given a homemade limoncello when i was in Tuscany, have to use that to make your limoncello cheesecake !!! That looks delicious! I've always wanted to know how to make limoncello!